Recently some case reports have shown that non vital, infected immature teeth can be alternatively treated by pulp regenerative process. ,,,,,,,,, The authors have termed this regenerative process as revascularization, ,,,, revitalization or maturogenesis. , The common aspect of all regenerative modalities is intra canal disinfection using copious irrigation, placement of antibiotic pastes and formation of a sterile blood clot inside the pulp cavity. The concept of pulp regeneration was first noted in traumatic avulsed and replanted immature teeth. ,, Rule  documented root development and apical barrier formation in cases of pulpal necrosis. The authors emphasized on the importance of sterile blood clot and granulomatous tissue within the pulpal cavity. Various possible explanations have been given to explain why apexogenesis/maturogenesis can occur in these infected immature permanent teeth. These include the presence of mesenchymal stem cells residing in the apical papilla, also known as stem cells of apical papilla (SCAP),  which are the multi-potent dental pulp stem cells,  and resistant to necrosis/infection. , The exact etiology, pathogenesis or histo-pathological events that occur in this regenerative process are still not known. Till date very few cases have been reported using pulp regeneration as a therapeutic therapy for the treatment of immature non vital teeth. It is necessary to compare the outcomes of conventional calcium hydroxide therapy and pulp revascularization procedure in same individuals, so that the general practitioners can compare both therapies. It is difficult to clinically find bilateral non-vital, immature, infected teeth with approximately similar root development stage. A case report is presented with bilateral immature central incisors treated with conventional calcium hydroxide apexification and pulp revascularization induced maturation procedures. A 24-year-old female patient presented with occasional pain, swelling and pus discharge in relation to upper front region of the face since past several months. The patient gave a history of trauma around 15 years ago, and the patient's medical history was noncontributory. After the general medical, dental and traumatic incident histories were reviewed, clinical and radiographic examinations were conducted. Palpation revealed bony hard maxillary labial cortical expansion with no intra-oral sinus formation. Both the central incisors had grade I mobility. Intraoral radiographs revealed immature apices associated with both maxillary central incisors [Figure 1]a. 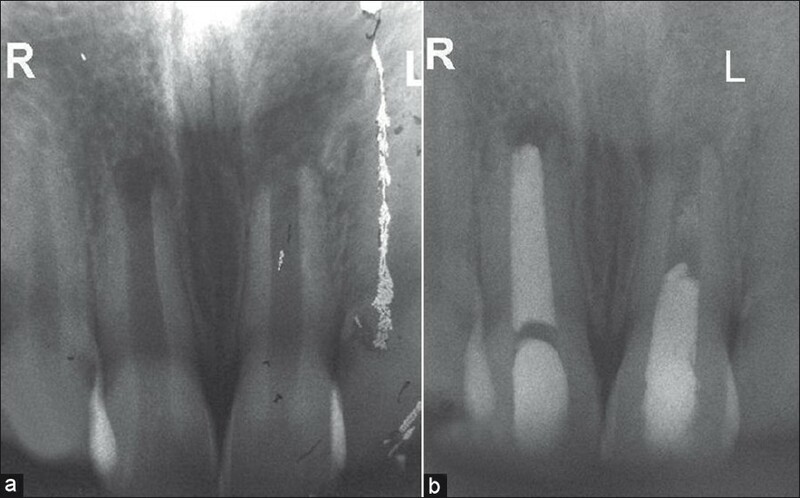 No root fracture was evident. The canals were wide with thin dentinal walls, slight flaring at apical end and associated peri-apical radiolucency. The lateral incisors had an intact periodontal ligament space with complete root formation and no root fracture. Response to electric pulp testing (Vitality Scanner, Analytic Technology, Glendora, CA, USA) and thermal tests were indicative of irreversible pulp damage. It was planned to perform conventional calcium hydroxide therapy followed by guttaperchaobturation in right maxillary central incisor, and revascularization procedures in left maxillary central incisor. Patient was explained all treatment options available. She was explained all risks and benefits of revascularization and calcium hydroxide apexification procedures, and an informed and written consent were obtained. After extensive clinical and radiographic examination, the maxillary central incisors were prepared for non-surgical endodontic therapy. A baseline preoperative radiograph was obtained. The patient received local anesthesia of 2% lidocaine with 1:100,000 epinephrine. A rubber dam was placed, and a conventional endodontic access opening was made with help of Endo Access burnumber A0164 (DentsplyMaillefer, Ballaigues, Switzerland). The conventional triangular access cavity was enlarged to correspond to the large pulp cavity with the help of slow speed diamond KGS3203 (DentsplyMaillefer, Ballaigues, Switzerland). After gaining access to the root canal system, the left central incisor showed frank purulent pus discharge from the root canal. The canal was gently irrigated and the patient was asked to wait for 30 minutes in the waiting area to let the purulent discharge to drain out from the pulp chamber. After the waiting period, the canals were irrigated and gently instrumented to confirm that there was no spontaneous discharge from any canal. The canals were then copiously irrigated with 5.25% sodium hypochlorite solution (Fórmula e Ação,São Paulo, Brazil) alternatively with 2% chlorhexidine solution (Sigma Chemicals, St.Louis, MO, USA) with intermediated rinse of distilled water. Minimal instrumentation of the root canal space was performed with sterile #60 K reamers, to prevent further weakening of thin fragile dentinal walls. A sterile cotton pellet was placed in the pulp chamber, and access cavity was sealed with a temporary restorative material (Cavit-G, 3M ESPE, St. Paul, MN, USA). The patient was recalled after 3 days and root canal system was reentered. The canals were copiously irrigated. Working length was estimated with the help of intra-oral peri-apical radiographs. Slurry of calcium hydroxide was made with the help of sterile local anesthetic solution and was carried 1 mm short of radiographic apex with a lentulospiral (Mani Inc. Japan). The slurry was compacted using wet cotton rolled on a sterile reamer. Care was taken not to push calcium hydroxide beyond the root canal confines. Entire root canal space was packed with calcium hydroxide dressing. In the left central incisor, a triple antibiotic paste containing minocycline, ciprofloxacin and metronidazole was packed 1 mm short of radiographic apex. The access cavity was sealed with a temporary restorative material (Cavit-G, 3M ESPE, St. Paul, MN, USA). After 2 weeks, the dressing was changed, and the calcium hydroxide and antibiotic paste were again placed in right and left maxillary central incisors, respectively. After 2 months, the right central incisor was conventionally obturated using laterally compacted, roll cone guttapercha technique with Tubli-seal (Kerr UK, Peterborough, U.K.). A radiograph was taken to establish the quality of the obturation. In the subsequent visit after 1 week, the left central incisor was prepared for revascularization procedure. Local anesthesia of 2% lidocaine with 1:100,000 epinephrine was administered and rubber dam was applied. The intracanal medicament was flushed with distilled water and 5.25% sodium hypochlorite solution. The canal system was dried with absorbent paper points. Peri-apical area was punctured thorough the root canal with 27G 31 mm needle (Septoject, Septodont, Saint-Maur-des-Fosses Cedex, France). Four short sharp stokes were used to intentionally induce bleeding inside the canal from peri-apical issues. When fresh bleeding was evident in the canal system, blood clot was allowed to form by tightly pacing a cotton pellet in the coronal third of the canal. After 10 minutes, cotton pellet was removed and coronal third was sealed with white MTA. The white MTA (ProRoot, Dentsply/Tulsa Dental, Tulsa, OK, USA) was mixed according to the manufacturer's instructions. It was initially carried to the coronal 1/3 rd using a MTA carrier, and then compacted using wet cotton rolled on a sterile reamer. The MTA was compacted to provide a radiographic extension of 5 mm into the canal. Squeeze dry cotton pellet was kept in the chamber and access cavity was sealed with a temporary restorative material (Cavit-G, 3M ESPE, St. Paul, MN, USA). After 48 hours, temporary restoration was removed and cavity was restored with a glass ionomer base (Ketac Molar Easymix 3M ESPE) and light cure composite resin (Z 350, 3M ESPE). A baseline radiograph was taken. The mobility of both the involved teeth decreased over a period of 3 months. Patient was recalled every 6 months for clinical and radiological evaluation [Figure 1]b, [Figure 2]a, b. After 24 months follow- up, there was no perceptible mobility of the involved teeth [Figure 2]c. Follow-up radiographs showed appreciable thickening of dentinal walls of the left central incisor. The mesial dentinal wall, which was incomplete in baseline radiographs had shown elongation. There was also evidence of root end closure along with root elongation. The peri-apical radiolucency was also not present in subsequent follow-up radiographs. On comparison with the right maxillary central incisor which underwent the traditional calcium hydroxide apexification technique, the left maxillary central incisor which had undergone the revascularization procedure, showed a better healing with maturogenesis. Recent advances in the field of regenerative medicine have led to a paradigm shift in the restoration of tissues affected by disease, trauma, cancer, or congenital deformity. These have inspired the dental researchers to look beyond just replacement of damaged tissues; and, the researchers are now trying to develop methods to regenerate them, rather than just replacing. A major challenge faced by most the endodontists is the treatment of thin, fragile blunderbuss canals in non vital teeth. Traditionally, the only regenerative therapy available in such cases was apexification using long term calcium hydroxide therapy. Frank  popularized calcium hydroxide apexification by using a mixture of camphorated monochlorophenol (CMCP) and calcium hydrovide [Ca(OH) 2 ]. Hiethersay  discarded CMCP because of its toxic effects, and used only Ca(OH) 2 to treat 21 necrotic, immature teeth. Majority of cases showed appreciable healing. One of the teeth was extracted because of root fracture and was histologically examined. Histopathological sections revealed new tissue formation consisting of pulp, interglogular dentin, and cementum and periodontal ligament (PDL) fibers. This led to the belief that regeneration of dental tissues was possible. Since then various clinical studies had demonstrated the efficacy of Ca(OH) 2 in apexification. ,, However, all the case reports and studies have documented only apical closure. There was no root elongation or maturation and all cases required subsequent root canal obturation. Ca(OH) 2 therapy was also shown to pose a threat of root fracture in 77% of immature teeth. ,, Also because of its high pH, it could damage the cells with regenerative capacity. Various other materials have been tried to induce apexification, such as tricalcium phosphate,  collagen calcium phosphate,  osteogenic protein-1  and mineral trioxide aggregate. However, none of the above mentioned methods lead to root elongation or maturation. Apical plug of mineral trioxide aggregate (MTA) and guttapercha filling is currently the clinician's choice and it has several advantages over calcium hydroxide induced apexification. MTA is a biocompatible material; has osteo-inductive properties; sets in the presence of moisture; and, the treatment can be completed in a single sitting. However, it does not strengthen the remaining tooth structure. The present case simultaneously evaluated conventional calcium hydroxide therapy and obturation, with revascularization induced maturogenesis. Response to pulp vitality tests, clinical examinations and purulent discharge on access opening indicated pulpal necrosis and infection. In spite of severe infection, some authors have demonstrated the presence of vital pulp cells in the apical third, evident by pain response on entering the deeper portion of canal in a non-vital tooth. ,,, Open apex provides a channel for stem cells residing in the apical papilla and new blood vessels to proliferate inside the pulp space over the blood clot matrix. Blood clot also plays an important role in regeneration by releasing various growth factors like platelet derived growth factor (PDGF), vascular endothelial growth factor (VEGF), platelet derived epithelial growth factor (PDEGF), tissue growth factor (TGF b). However, one cannot rely on these factors as concentration of trapped cells in the fibrin clot is unpredictable. The cumulative effects of above mentioned factors and cells lead to proliferation and differentiation of cells into odontoblasts, under the organizing influence of cells of Hertwig's epithelial root sheath (HERS). ,, The newly formed odontoblast lineages from stem cells in pulp tissue or apical papilla lay down atubular dentin at the apical end, as well as on lateral aspects of dentinal walls of the root canal, leading to maturogensis. A critical step in regenerative therapy is complete disinfection of the root canal space using copious irrigation, minimal instrumentation and placement of antibiotic pastes. ,,,,,,,,, Calcium hydroxide was avoided as it could weaken the root dentin and also its high pH could destroy vital apical cells including SCAP. This regenerative therapy can provide advantage over traditional apexification as there is elongation as well as strengthening of the root due to reinforcement of lateral dentinal walls, with deposition of new dentin/hard tissue. There are certain limitations to this approach such as : B0 leeding into the canal space is necessary,  and this treatment option is not indicated in cases where post and core is the final restorative treatment plan, as the vital tissue in apical 2/3 rd of the canal cannot be violated for post placement. In conclusion, revascularization induced maturogenesis, where indicated, can provide several advantages over conventional apexification procedures. A detailed histo-pathological study is necessary to demonstrate the actual contents of pulp space after revascularization procedures. 1. Kleier DJ, Barr ES. A study of endodonticallyapexified teeth. Endod Dent Traumatol 1991;7:112. 2. Andreasen JO, Farik B, Munksgaard. Long-term calcium hydroxide as a root canal dressing may increase the risk of root fracture. Dent Trautamol 2002;18:134-7. 3. Andreasen M, Lund A, Andreasen JO, Andreasen FM. In vitro solidity of human pulp tissue in calcium hydroxide and sodium hypochorite. Endod Dent Traumatol 1992;8:104-8. 4. Rosenberg B, Murray PE, Namerow K. The effect of calcium hydroxide root filling on dentin fracture strength. Dent Traumatol 2007; 23:26-9. 5. Cvek M. Prognosis of luxated non-vital maxillary incisors treated with calcium hydroxide and filled with guttapercha. Endod Dent Traumatol 1992;8:45-55. 6. Simon S, Rilliard F, Berdal A, Machtou P. The use of mineral trioxide aggregate in one-visit apexification treatment : A0 prospective study. IntEndod J 2007;40:186-97. 7. Iwaya S, Ikawa M, Kubota M. Revascularization of an immature permanent tooth with apical periodontitis and sinus tract. Dent Traumatol 2001;17:185-7. 8. Banchs F, Trope M. Revascularization of immature permanent teeth with apical periodontitis : N0 ew treatment protocol? J Endod 2004;30:196-200. 9. Chueh LH, Huang GT. Immature teeth with periradicular periodontitis or abscess undergoing apexogenesis : A0 paradigm shift. J Endod 2006;32:1205-13. 10. Shah N, Logani A, Bhaskar U, Aggarwal V. Efficacy of revascularization to induce apexification/apexogensis in infected, nonvital, immature teeth : A0 pilot clinical study. J Endod 2008;34:919-25. 11. Jung IY, Lee SJ, Hargreaves KM. Biologically based treatment of immature permanent teeth with pulpal necrosis : A0 case series. J Endod 2008;34:876-87. 12. Cotti E, Mereu M, Lusso D. Regenerative treatment of an immature, traumatized tooth with apical periodontitis : R0 eport of a case. J Endod 2008;34:611-6. 13. Ding RY, Cheung GS, Chen J, Yin XZ, Wang QQ, Zhang CF. Pulp revascularization of immature teeth with apical periodontitis : A0 clinical study. J Endod 2009;35:745-9. 14. Huang GT. A paradigm shift in endodontic management of immature teeth : C0 onservation of stem cells for regeneration. J Dent 2008;36:379-86. 15. Weisleder R, Benitez CR. Maturogenesis : I0 s it a new concept? J Endod 2003;29:776-8. 16. Ham JW, Patterson SS, Mitchell DF. Induced apical closure of immature pulpless teeth in monkeys. Oral Surg Oral Med Oral Pathol 1972;33:438-49. 17. Cvek M, Cleaton-Jones P, Austin J, Lownie J, Kling M, Fatti P. Pulp revascularization in reimplanted immature monkey incisors - predictability and the effect of antibiotic systemic prophylaxis. Endod Dent Traumatol 1990;6:157-69. 18. Skoglund A, Tronstad L, Wallenius K. A microangiographic study of vascular changes in replanted and autotransplanted teeth of young dogs. Oral Surg Oral Med Oral Pathol 1978;45:17-28. 19. Rule DC, Winter GB. Root growth and apical repair subsequent to pulpal necrosis in children. Br Dent J 1966;120:586-90. 20. Huang GT, Sonoyama W, Liu Y, Liu H, Wang S, Shi S. The hidden treasure in apical papilla : T0 he potential role in pulp/dentin regeneration and bioroot engineering. J Endod 2008;34:645-51. 21. Murray PE, Garcia-Godoy F, Hargreaves KM. Regenerative endodontics : A0 review of current status and a call for action. J Endod 2007;33:377-90. 22. Heithersay GS. Stimulation of root formation in incompletely developed pulpless teeth. Oral Surg Oral Med Oral Pathol 1970;29:620-30. 23. Lin L, Shovlin F, Skribner J, Langeland K. Pulp biopsies from the teeth associated with periapical radiolucency. J Endod 1984;10:436-48. 24. Frank AL. Therapy for the divergent pulpless tooth by continued apical formation. J Dent Assoc 1966;72:87-93. 25. Heithersay GS. Stimulation of root formation in incompletely developed pulpless teeth. Oral Surg Oral Med Oral Pathol 1970;29:620-30. 26. Nevins A, Wrobel W, Valachovic R, Finkelstein F. Hard tissue induction into pulpless open-apex teeth using collagen-calcium phosphate gel. J Endod 1977;3:431-3. 27. Shabahang S, Torabinejad M, Boyne PP, Abedi H, McMillan P. A comparative study of root-end induction using osteogenic protein-I, calcium hydroxide and mineral trioxide aggregate in dogs. J Endod 1999; 25:1-5. 28. Gronthos S, Brahim J, Li W, Fisher LW, Cherman N, Boyde A, et al. Stem cell properties of human dental pulp stem cells. J Dent Res 2002;81:531-5. 29. Wang Q, Lin XJ, Lin ZY, Liu GX, Shan XL. Expression of vascular endothelial growth factor in dental pulp of immature and mature permanent teeth in human. Shanghai Kou Qiang Yi Zue. 2007;16:285-0.